I grill a lot. You may have noticed this by reading southbyse.com. It is just easy since we live in such a temperate climate here in the Lowcountry. I also like the fact that with the gas grill it’s an easy cleanup and we keep the heat out of the house, especially this time of year. • The original recipe calls for only olive oil but I have found that using mostly canola oil (or safflower or grape oil) is better since olive oil has a lower burn temperature. 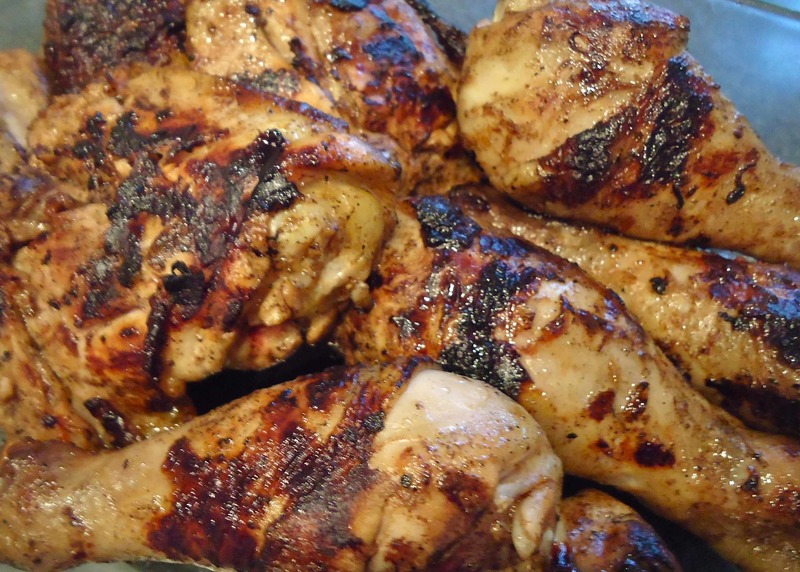 • I also like this with drumsticks and thighs as I find grilled chicken breasts seems to dry out – plus I like the rich flavor of ‘dark meat” chicken. Oh, thighs and legs are less expensive too. • Use bone-in chicken not boneless. The bones add flavor and give the meat something to hang on to… boneless thighs tend shrink up to nothing. By the same measure I prefer leaving the skin on as it helps keep the meat moist and makes for a prettier presentation too with a nice grill-mark sear on the grill. This grilled chicken is a superb entrée for a crowd and since should soak awhile, it’s mostly a do-ahead recipe. You can easily double or triple this recipe. If you want to go authentic Moroccan serve with a couscous salad, grilled eggplant and mint tea. Or go Southern-style with homemade potato salad, grilled zucchini squash and Vidalia onions and iced tea (or a fairly full-bodied Chardonnay or Saint-Véran Burgundy). 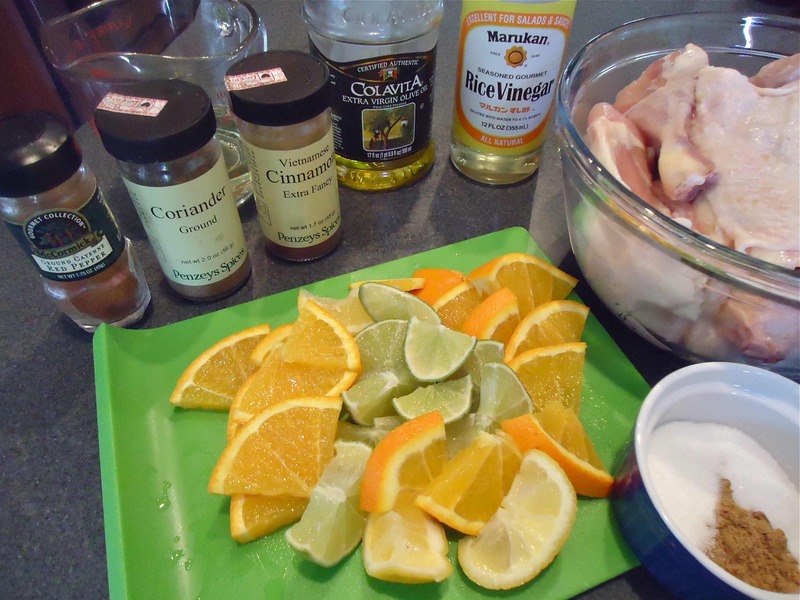 Ingredients include lots of spices, fresh citrus fruits and chicken, of course. 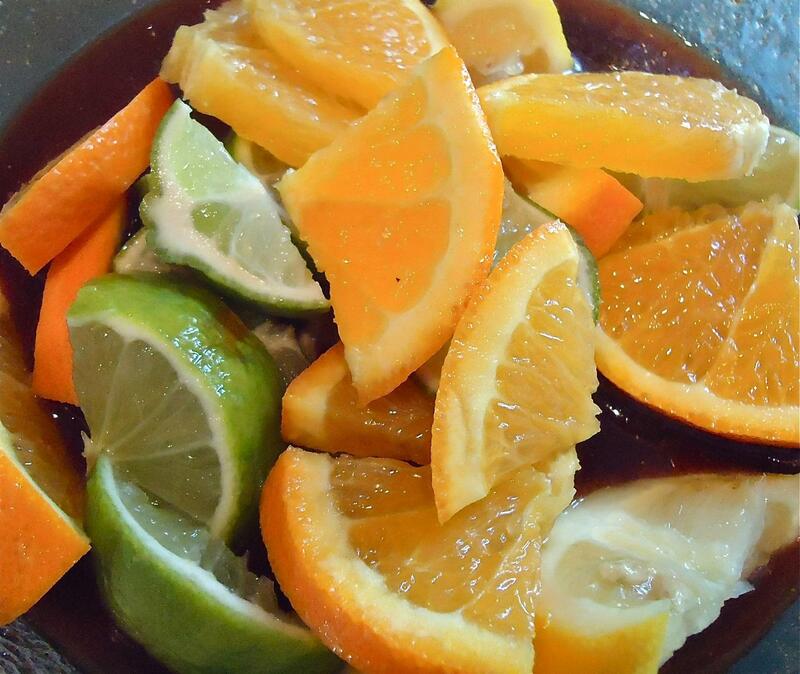 A close up of the pretty limes, oranges and lemon. Smells divine! This is an easy recipe. the most time consuming part is getting all the ingredients together – here is everything but the sliced fruit in a bowl. Just mix it together. Place the chicken pieces in the bag , add the marinade and the sliced fruit. Make sure the marinade is coating the chicken and place the closed bag ( or covered bowl) in the refrigerator. During the marinade time flip the bag over a time or two. After marinating all day this is how the chicken looks. You can discard the fruit and excess marinade. Get your grill ready! The chicken goes onto the grill. 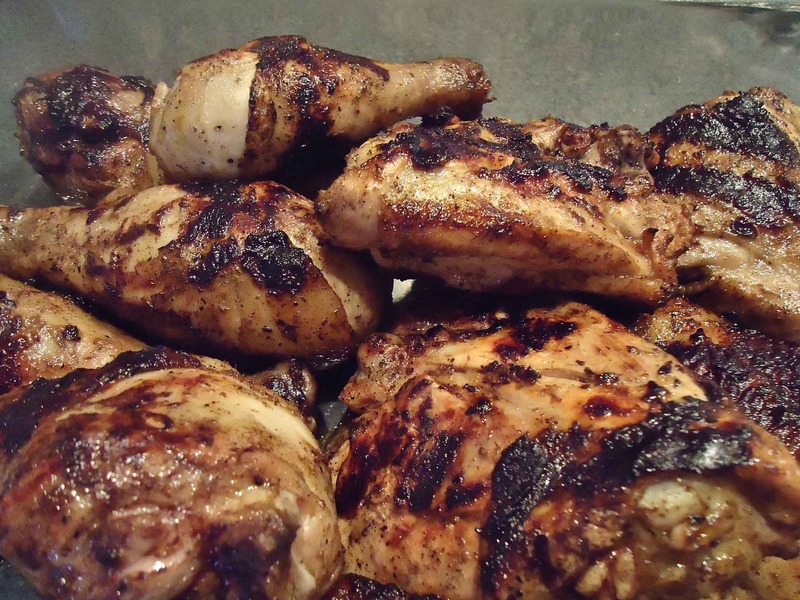 Be sure to watch it carefully as both the oil-infused marinade and the chicken itself can cause flare-ups and burning. Another shot of the grilled chicken. Moist and flavorful! Chicken pieces: mixed thighs and drumsticks, 12 pieces in total. Do NOT use boneless. Wash and dry chicken pieces and set aside. 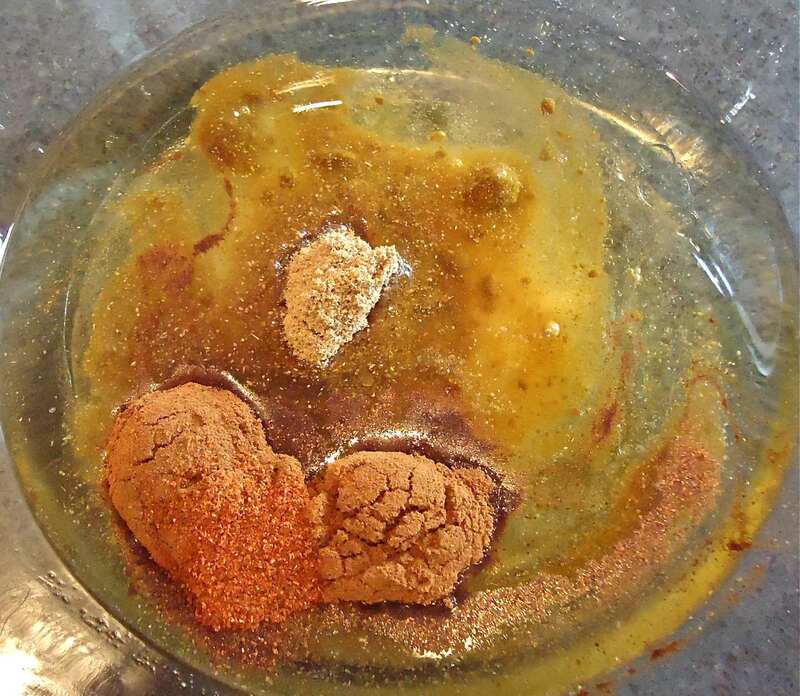 In a bowl mix the oils, vinegar, spices and salt. Add in the juice from 1 orange. Add sliced fruits. 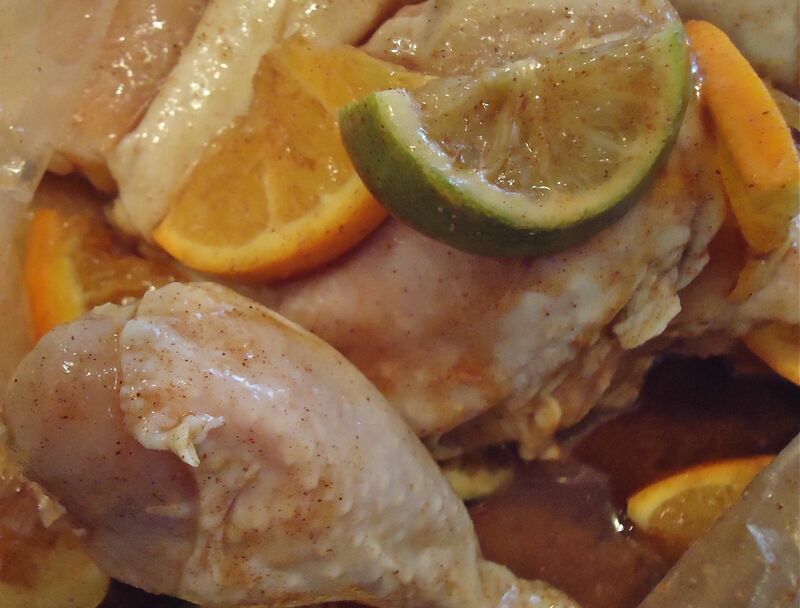 In a large zippered plastic bag or shallow container add chicken and pour the marinade and fruit over the chicken. 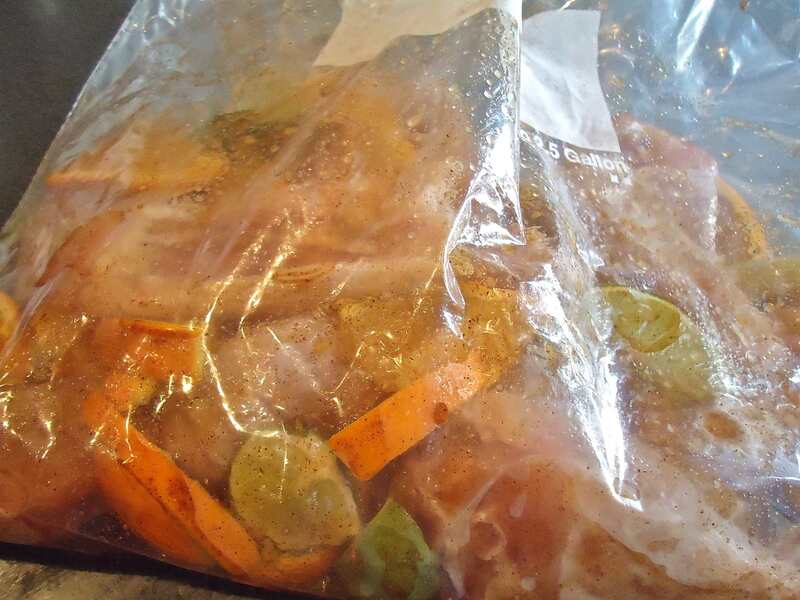 Cover or secure the bag and place in the refrigerator to marinate at 8-12 hours. Turn the mixture over a few times throughout the marinating time. Prepare your grill. 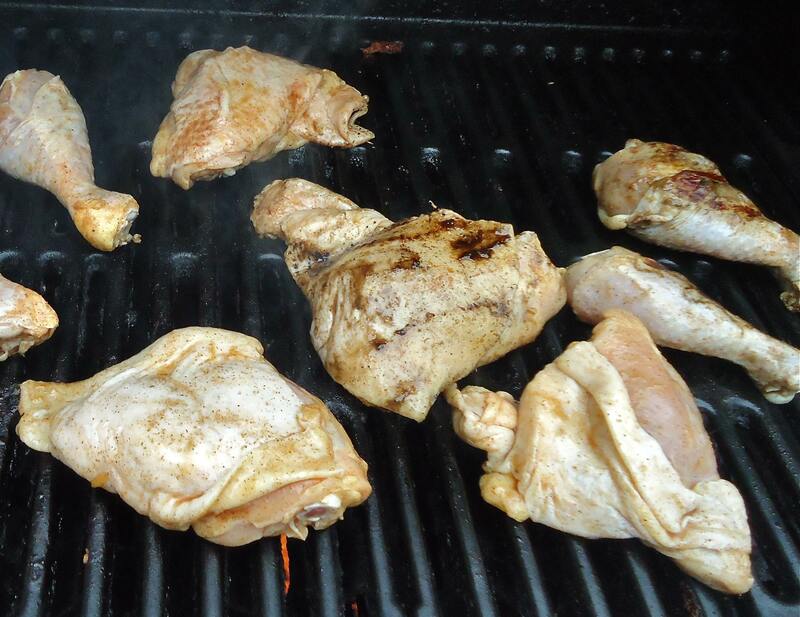 When ready, sear chicken pieces on the grill, careful that they do not burn. Since the marinade contains a lot of oil (and if the skin is left on the chicken) it will easily catch on fire. Grill until cooked through. Serve immediately. Serves 6. This entry was posted in Recipes and tagged chicken recipes, entree recipes, grilled foods, moroccan chicken, southbyse.com. Bookmark the permalink. How funny! I think we were reading each other’s blogs simultaneously. And you know what? My weekend menu just changed after reading yours! Absolutely delicious!